Lost sunken cities of the ancient world : evidence of cataclysmic events, thousands of years ago? To date, we have only have explored around 5% of the ocean (source). But despite this fact, all around the planet, we have found evidence of lost-sunken-ancient cities, some of them dating back to around the last ice age when ocean levels were once much lower than they are today. These are lost underwater worlds which hold countless secrets beneath the surface, secrets which according to many authors, promise to rewrite everything we thought we knew about history. All over the world, there are sunken cities. Some have been found, others remain shrouded in mystery and legends. However, in every single corner of our Globe, we will find evidence of cities that crumbled and were devoured by the ocean. There’s more than 200 known sunken cities in the Mediterranean alone and what we’re looking at are the remains of cities at a time when mainstream archaeology tells us there were no cities, anywhere in the world. Covering more than 71% of the planet, the Earth’s oceans are a vast and largely unexplored mystery and even today we have trouble accessing and mapping the ocean floor. For most of recorded history, man could only guess at what lay beneath the ocean’s surface, but thanks to today’s technology we are able to explore our oceans with greater detail than ever before. Today we have equipment that can access areas and depths that some years ago were inaccessible to us and we could only guess what was really down there, how many amazing underwater worlds are just waiting to be found? In fact, to date, we have explored less than five percent of the ocean. Much remains to be learned from exploring the mysteries of the deep. The ocean is the lifeblood of Earth, covering more than 70 percent of the planet’s surface, driving weather, regulating temperature, and ultimately supporting all living organisms. Artists depiction of the location of Atlantis; according to Plato. Image credit unknown. Philosophers and scientists throughout history have been drawn to one of the greatest mysteries of the sea, the legend of the lost city of Atlantis. Most of what we know comes from the Greek philosopher Plato, who wrote two books about Atlantis, the Timaeus and the Critias. Plato described Atlantis as a highly advanced city, ringed by concentric walls, which flourished 9,000 years before his own time. It is believed that Atlantis had huge naval forces, which it used to conquer other parts of the world. According to the legend, after a failed attempt to invade Athens, disaster struck the island and according to Greek philosopher Plato, Atlantis was destroyed in a day and a night but some researchers believe that the Atlantian somehow destroyed themselves. The location of the real Atlantis remains a mystery even today, and even though many archaeologists may claim to have found the city, no conclusive evidence has been provided to support any discovery. According to Plato Atlantis was located in front of the Pillars of Hercules a location beyond what some scholars attribute to modern Gibraltar. Researchers and scholars worldwide have discussed Atlantis proposing a number of theories and personal opinions. Ken Feder, professor of archaeology suggest several things regarding Atlantis in his book; Frauds, Myths, and Mysteries: Science and Pseudoscience in Archaeology. Professor Ken suggests that the Atlanteans were an incredibly sophisticated but evil culture that attempted to dominate the world by force. Practically, Professor Ken portrays the Atlantean civilization as an evil and war based civilization, whose only goal was conquest. 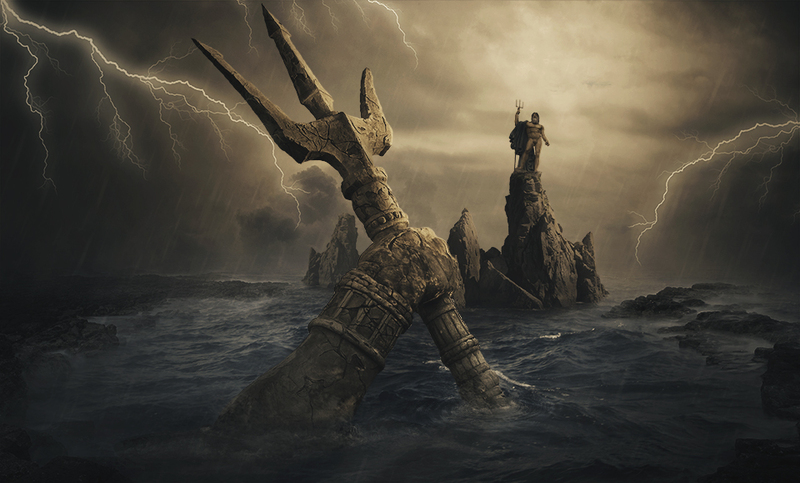 According to Plato, Atlantis was protected by the god Poseidon who made his son Atlas king of this mythical land. The Atlanteans grew powerful but suffered ethically; their great armies were able to conquer Africa as far as Egypt and Europe going as far as Italy. According to one theory, it was by a divine punishment that the “continent-island” sank; in one day and one night. But there are several other theories that have been proposed about mythical Atlantis. Swedish scientist and writer Olaus Rudbeck proposes a rather interesting theory. Between 1679 and 1702 wrote a three thousand page treatise in four volumes called Atlantica where the author try to prove that Sweden was Atlantis, the cradle of civilization and that all human languages evolved from Swedish. The theory proposed by Rudbeck was heavily criticized by Scandinavian scientists and authors. Interestingly, according to ‘Atlantis Rising’, the discovery of massive ‘stone anchors’ located in the Strait of Gibraltar suggests that the powerful ancient civilization described by Plato may have in fact existed. In 2000 while mapping the seafloor off the western coast of Cuba, a research expedition led by Russian-Canadian oceanographer Paulina Zelitsky spotted symmetrical stone structures deep below the water, this expedition was armed with side-scan sonar equipment used to create images of large areas of the seafloor and underwater objects. They came up with some amazing discoveries. Several pictures were snapped of what appear to be roads, man-made structures, temples, and pyramids. Most structures were gigantic, reaching 16 feet in height and weighing several tons and around 30 geometric structures emerged appearing to be the remains of streets, buildings, tunnels and pyramids, all at a depth of 2,200 feet below the surface of the water. In 2001 researchers from India’s Oceanic Institute detected anomalies on the bottom of the Gulf of Khambhat, seven miles from the shore. Their side-scan sonar started returning images of regular structures, and the images revealed an enormous network of stone buildings, now shrouded in mud and sand, and covering a distance of five square miles. The discovery was intepreted as the remains of an ancient city—or cities as it appears they are two. They are positioned on the side of ancient river channels, they look cities that have been submerged for a very long time, more precisely at a time when mainstream archaeology tells us there were no cities anywhere in the world. 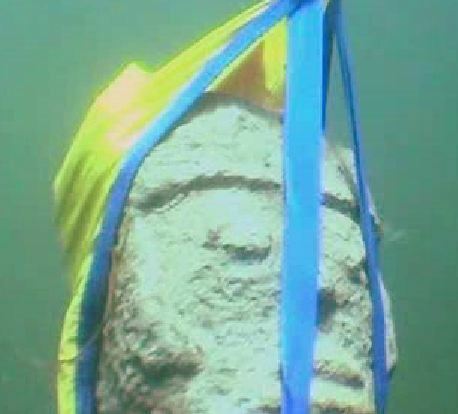 Scientists retrieved dozens of artifacts, including wood and pottery shards and this proves to be an amazing underwater world forgotten by history. 200 miles to the northwest lies the modern city of Dwaraka, archaeologists digging deep under the city found signs of a settlement once inundated by the sea. Interestingly, they were so inspired that they began searching for more ruins in waters just off the coast and in only 70 feet of water, divers discovered sandstone walls, cobblestone streets and evidence of a prosperous seaport. Scholars declared these ruins to be the remains of the ancient and legendary city of Dwaraka. The Andes Mountains, Peru. At an elevation of 12,500 feet, lie the dark waters of Lake Titicaca, the highest navigable body of water in the world. In August of 2000, an Italian team of divers and archaeologists launched an underwater investigation of the legendary lake, submerged under 100 feet of water, the team uncovered traces of a paved road’s, stone terraces and a wall nearly a half mile long. For centuries, local legends have spoken of a lost underwater city called Wanaku. 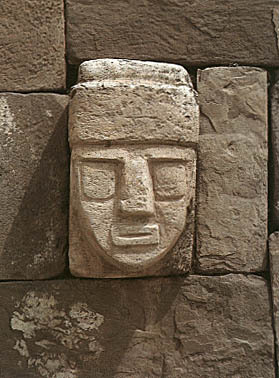 Lying on the lake bed was a large, sculptured stone head and comparisons were quickly made to similar stonework found at the nearby ancient city of Tiahuanaco, just 12 miles south of Lake Titicaca. Is it possible that Wanaku lies at the bottom of this mysterious lake? Archaeologists have problems explaining why there are sunken ruins there, they’re saying that the ruins aren’t that old, they’re only 1,500 years old. What this means is that Lake Titicaca has gone through a number of major changes in that period. In the Aymara legends, the lake is like the place of genesis, it is the place where it starts, the birthplace of all civilizations of the continent. The picture below is a comparison to the sculptured head that was retrieved from the bottom of lake Titicaca and as you can see there are incredible similarities. All of this is located near Tiabuanaco and Puma Punku, and Tiahauanco—the city complex—was the center of the ancient Tiahuanaco civilization, an extremely well-developed pre-Inca culture that based its economy on agriculture, architecture, and livestock. The ancient culture covered the territories of the Collao plateau, located between southwest Peru, western Bolivia, north of Argentina and northern parts of Chile, regions from which the culture passed on its technological and religious influence towards other contemporary civilizations. The city of Tiahuanaco is characterized by its incredible intricate architectural style, decorated with countless reliefs, which in turn are shrouded in mystery. The city complex is composed of several important architectural constructions: the Akapana, Akapana East, and Pumapunku stepped platforms, the Kalasasaya, the Kheri Kala, Putuni enclosures, and the Semi-Subterranean Temple, Puerta del Sol (Gateway of the Sun) and Puma Punku which in turn has countless structures that defy mainstream archaeologists. These incredible underwater ruins have been a subject of debate between archaeologists and researchers ever since its discovery in 1985 by Dive Tour operator Kihachiro Aratake. Ever since the mysterious structures were found, people have discussed whether they are manmade or natural formations. Some researchers and historians believe that the structures at Yonaguni could be the ancient remains of Mu, a fabled Pacific civilization rumored to have vanished beneath the Ocean. While mainstream researchers believe these structures are not the work of ancient mankind, research on the underwater complex tells a different story. 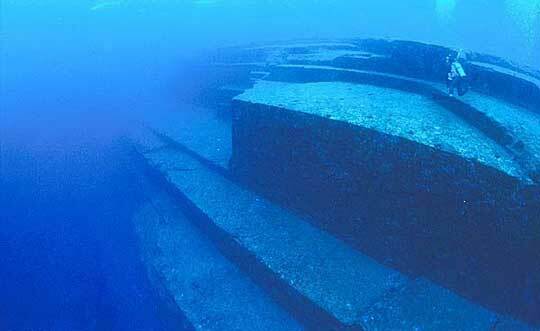 The main “monument” at the underwater complex of Yonaguni consists of medium to very fine sandstone and mudstone blocks that belong to the Lower Miocene Yaeyama Group which researchers believe were deposited about 20 million years ago. The above mentioned are only some of the countless ancient sunken cities that have already been found by experts. The truth is that we have absolutely no idea what lies beneath the ocean until we put a greater effort in exploring our planet’s ocean, with the same passion we look for alien life on Mars and the universe.